One of a few dignitaries to make the visit “behind the Redwood Curtain,” Napolitano received a gift of burl wood engraved with the UC seal. At Arcata High School last week, 50 college-bound seniors from across Humboldt County packed into the library. They had all been accepted to UC, and were full of questions about what to expect – questions answered by the premier expert on the subject: UC President Janet Napolitano. In a meet and greet with UC-bound seniors, Napolitano offered advice on the journey ahead. 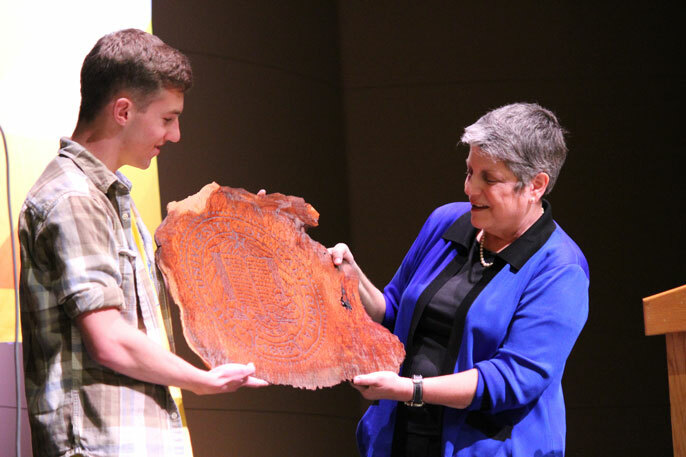 Napolitano’s April 28 visit to Arcata High School was one of a half dozen similar trips this spring in which the president made the case directly to students around California that a UC education is an excellent – and affordable – college option. “I came to UC because I believed so strongly in the university’s mission. The education there is truly a game-changer,” Napolitano told students. Napolitano gave few formal remarks, and instead invited students – who were making their final decisions about where to attend college – to ask her whatever they wanted. The queries ranged from how the university spends its tuition dollars (A: on research and academic operations) to whether students should spend a semester studying abroad. Arcata High School student body president Cait Parker. Arcata student body president Cait Parker wanted to learn more about what makes UC campuses stand apart. “We’ve worked really hard for the prestige of the UC system, but I’d like to hear her opinion of what the university has to offer," Parker said. Napolitano pointed to UC’s excellence and scale, which enables it to provide an unmatched array of opportunities for undergraduate research, public service, arts and humanities scholarship, entrepreneurship and other areas. “No other school in the country provides the breadth and depth of opportunity that UC does,” she said. She encouraged students to be proactive in seeking out what each campus has to offer, an answer that resonated for Arcata senior Kaelyn Tuermer-Lee. Over the last several months, Napolitano has visited schools, churches and community organizations as part of Achieve UC, an effort to reach out to students in communities that are typically underrepresented at UC with a college-going message. The university is also looking to draw more heavily from students in underrepresented parts of the state, like the far north. Students at Arcata High School and other area schools grow up with Humboldt State and College of the Redwoods in their backyard, but are less familiar with the UC campuses. Arcata school officials say they believe Napolitano’s visit to the area will encourage more students to consider UC. “For the students who do the very hard work to be accepted to UC, and then to have the president of the system here to celebrate, that is an awesome thing for these kids,” said Jim Ritter, career exploration and community outreach coordinator for the Northern Humboldt Union High School District, which represents seven schools along the state’s northern coast. In the school’s courtyard, students gathered around a bulletin board indicating where their classmates are going to college. Following her meeting with UC-bound students, Napolitano spoke at a rally of sophomores and juniors from seven area schools to urge them to start planning now for UC eligibility. Napolitano told students that the region is home to many accomplished UC alumni and is also the first place that UC opened a county extension office, in 1913. She also detailed the robust financial aid program that enables more than half of UC students to pay no tuition, and which provides support to roughly two-thirds of all UC students. Half of UC students graduate with no debt, she told students. Of those who do take out loans, most borrow about $20,000 over the course of their college career, less than the national average and about the price of a low- to mid-priced car. At the end of the day, UC Berkeley-bound Arcata senior O.B. Kwon, who plans to study engineering and physics, and play clarinet in the marching band, said he felt more confident than ever about what lies ahead. “She answered a lot of my questions, and I think those that other people had too,” he said.